Gucci, autumn/winter 2001-02 ready-to-wear collection designed by Tom Ford. York. Awards: National Italian-American Foundation Special Achievement award, 2001 [de Sole]. Company Address: 73 Via Tornabuoni 50100, Florence, Italy. Company Website: www.gucci.com . McKnight, Gerald, Gucci: A House Divided, New York, 1987. Crittendon, Ann, "Knock-Offs Aside, Gucci's Blooming," in the New York Times, 25 June 1978. "Artisans & Art: Gucci," in Fortune, 23 July 1984. "Gucci, Taking Control," in WWD, 9 January 1987. Gucci, fall/winter 2001-02 collection: velvet baby doll dress. McKnight, Gerald, "Gucci: Hell for Leather," in the Sunday Times Magazine, (London), 6 September 1987. Wolman, Karen, "Can an Outsider Fill Aldo Gucci's Loafers?," in Business Week, 30 November 1987. "Gucci's Empire Splits a Seam," in Time, 20 June 1988. "Aldo Gucci," in the New York Times, 21 January 1989. McKnight, Gerald, "Aldo Gucci," [obituary] in The Independent, 23January 1990. Rossant, John, "Can Maurizio Gucci Bring the Glamor Back?" in Business Week, 5 February 1990. Jereski, Laura, "Watch Your Step, Cousin Paolo," in Forbes, 15October 1990. Howell, Georgina, "Gucci Again," in Vogue, December 1990. Dudar, Helen, "Reversal of Fortune: Dawn Mello Gets Gucci Back onIts Feet," in Working Woman, April 1991. Friedman, Arthur, "Aldo Gucci Dies at 84," in WWD, 29 May 1992. Costin, Glyn, "Dawn Mello Revamping Gucci," in WWD, 29 May 1992. Spindler, Amy M., "A Retreat from Retro Glamor," in the New York Times, 7 March 1995. "Paolo Gucci," [obituary] in the Economist, 28 October 1995. Infantino, Vivian, "Tom Ford: The Driving Force Behind Gucci's Revved-Up Performance," in Footwear News, 4 December 1995. Min, Janice, "Couture de Force: Gucci is Once Again Chichi Thanks to the Savvy Designs of Tom Ford," in People, 4 March 1996. Rawsthorn, Alice, "Prada Move Puts Gucci on Defensive," in the Financial Times, 7 July 1998. Menkes, Suzy, "Gucci Buys House of YSL for $1-Billion," in the International Herald Tribune, 16 November 1999. Givhan, Robin, "Givenchy's Loss, Gucci's Gain—Designer Alexander McQueen Leaves LVMH," in the Washington Post, 5 December 2000. 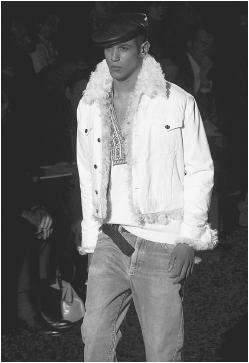 "At Yves Saint Laurent, Tom's Triumph," in WWD, 15 March 2001. Menkes, Suzy, "Gucci Gets Europe's Hottest New Designer," in the International Herald Tribune, 7 July 2001. The illustrious name of Gucci began as a mark on leather goods produced in Florentine workshops for the young Guccio Gucci. Inspired by the grandiose luggage transported by wealthy guests to the Ritz Hotel in London, where Gucci worked in the kitchens, the young Italian returned to his native country where he began making leather luggage. The characteristic double-G motif printed on the canvas was introduced after World War II due to a shortage of leather. Its bold red and green bands on suitcases, bags, satchels, wallets, and purses have become one of the most copied trademarks in the world, along with France's Louis Vuitton. The Florence-based company grew to international proportions in the postwar period, expanding its range to include clothing, fragrances, household items such as decanters and glasses painted with the distinctive red and green bands, scarves, and a slew of other accessories. It was this indiscriminate expansion that ultimately proved to be detrimental to the name of Gucci for, as Yves Saint Laurent's director Pierre Bergé once said, "A name is like a cigarette—the more you puff on it the less you have left." Added to this overexposure was the proliferation of Gucci imitations which reputedly cost the company a fortune in legal fees, along with infamous conflicts between the volatile members of the Gucci clan. All were detrimental to the high profile image the company needed to maintain. There were, however, many Gucci items that became status symbols in their own right—such as the Gucci loafer with its unmistakeable gilt snaffle trim which, according to the New York Times was what carried the company to fortune. Biographer Gerald McKnight notes in his book Gucci: A House Divided, (New York, 1987) that the loafer even became the subject of well-worn jokes in the 1970s when the name Gucci became as well known as household items such as the Hoover and cellophane tape. Gucci, spring/summer 2002 ready-to-wear collection. an American woman, Dawn Mello, who restored the luxurious image of Gucci when, in 1989, she was appointed executive vice-president and creative director of the company. Under her control, the existing Gucci lines were edited and refined, and fewer, more select new items introduced. Mello provided a clever combination of just the right balance of historical relevance and a real sense of modernity which restored Gucci to its former glory as a "must have" name. She was helped by designer Tom Ford who came to Gucci in 1990. Three years later, in 1993, the Gucci clog was a sell-out item among the fashion cognoscenti and became the most copied shoe style of the season. Gucci was once again established as a purveyor of luxury goods but also as a serious contender in the high fashion stakes. This same year, the firm was acquired by Investcorp, and the following year relocated its headquarters from Milan to Florence. Mello however, left to rejoin Bergdorf Gordman in New York, and Ford was named Gucci's creative director. Ford proved a good fit for Gucci, his collections took the house back to its must-have status. Along the way came corporate intrigue, when rival Prada suddenly acquired a chunk of Gucci in 1998, only to turn around and sell to archrival LVMH in 1999. The events sparked a takeover attempt, with Gucci narrowly escaping due to white knight François Pinault, whose Pinault Printemps Redoute bought in to Gucci. Pinault and Gucci CEO Domenico de Sole soon gave LVMH a run for its money in the bid to become the world's largest luxury firm. Though LVMH was ahead, Gucci was a force to be reckoned with and pursued the same targets as LVMH, such as Fendi in 1999. LVMH, partnered with Prada, prevailed; with Prada eventually selling its stake to LVMH. Gucci itself then went on a buying spree, acquiring stakes in Boucheron, Sergio Rossi, and Bottega Veneta. By the end of the 20th century, Gucci had become a global competitor and flexed its muscle with the acquisition of Yves Saint Laurent and Balenciaga. Tom Ford, widely considered Europe's top designer by this time, took the design reins at YSL in addition to his Gucci responsibilities, and the Balenciaga buy brought hot new designer, Nicolas Ghesquiére into the fold. Alexander McQuuen, who had defected from LVMH, and Stella McCartney, another sensation, had also joined Gucci. With four of the fashion world's most acclaimed designers under its roof, Gucci was sure to take the catwalk by storm.